Providence Perfume Co has fast emerged as one of my favorite indie natural brands. I don't like everything they make — Mousseline Pêche was not my cup of tea, and neither was Moss Gown, which sounded like it ought to be my cup of tea. Branch & Vine, their latest release, might as well have been tailor-made to suit my preferences, and to suit this time of year, when summer is winding down and I'd just as soon it lasted a bit (ok, much) longer. Branch & Vine was inspired by a summer garden — "Verdant leafy greens, a tangle of tomato vine. Hints of muguet mingle with mimosa, jasmine and cooling violet leaf" — and that's just what it smells like: greenery, not too bitter and not too heavy, sweetened by a few flowers along the way.1 Fir lends some weight to the base and vetiver adds a dash of earthiness (other notes: sunflower, green bitter orange and neroli) but it's more breezy than deep.2 Without sinking into what Kevin calls the "naturopathic cough syrup or joint rub" style that sometimes characterizes natural perfumery, Branch & Vine smells alive, like the outdoors on a perfect summer day. Just for kicks, I wore it next to Chanel's lovely Bel Respiro. Bel Respiro is elegant and spare, and smells like what it is: a perfect summer day à la Chanel. Branch & Vine's garden outing is not clunky in the least, but it's not quite so aggressively manicured. It would be awfully nice to have bottles of both. We all know that natural perfumes aren't powerhouses of longevity, but hey, neither is Bel Respiro. Summer doesn't last, more's the pity. But in this case, the natural product did a little better than the synthetic. The quick poll: your favorite green fragrance? 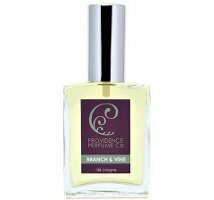 Providence Perfume Co Branch & Vine is available in 30 ml Cologne Spray ($80). 1. If you want a shock of bitter green (tomato leaf! ), try the fabulous Memory of Kindness by CB I Hate Perfume, or hunt down some vintage Vent Vert, or the maybe-even-harder-to-find Gobin Daudé Sous Le Buis. For a really vibrant but not bitter green, try Dawn Spencer Hurwitz Shiso. 2. For a fall-weight green, try the also-fabulous Verdant by Tauer Perfumes. haha, naturopathic cough syrup (want to avoid those too). Love green scents, too many to name, but a couple of vintage ones I’m enjoying now are Scherrer, Silences and Frond by Vincent that I found at an antique mall. I find Bas de Soie and no 19 to be nice greens that are more readily available. Still need to give Bel Respiro a proper try. I love the name Frond! Never heard of that one. Maybe I’m slowly becoming sophisticated and subtle enough to return to green scents and see if they suit me. Up to this point, though, I fear I have opted for Marilyn Monroe over Audrey Hepburn. This summer *has* brought me a new appreciation for airy linden blossom and fresh, creamy fig, so perhaps there’s hope for me! MR, have you tried Annick Goutal Ninfeo Mio? It’s a nice combo of green notes and creamy fig, plus citrus. Agree, great scent — another of my favorite greens. I want to say that I did give that a sniff on my last trip to Our Lady and found it to be very nice! I think the fig I want to buy, though, is Acqua di Parma’s Fico de-whatever. It’s got a very bright citrus–grapefruit?–opening that I really like. Sadly, it is currently out of stock at the Perfume House, so I’ve been put on hold. . .
Fico di Amalfi! And that means you should probably try Hermès Un Jardin en Méditerrannée too. I adore linden blossom. Which one(s) have you fallen for? Robin, over a few days in July, I drained a large spray sample of Tauer’s Zeta. So, I purchased a bottle and have worn it more days than not the past three weeks! It is definitely softer than what I normally wear, but it feels right–sunny and fresh–for this oddly humid (by Oregon standards) summer! Thanks! Admit that is one of the Tauers that just doesn’t work for me. Really liked the Kerosene Pretty Machine, and used to love d’Orsay Tilleul — don’t know if they’re reformulated it. Both great actresses. MM claimed to sleep in nothing but Channel No. 5, hardly a perfume endorsement a fume head should be ashamed to follow. I believe Hepburn, was associated with Givenchy in perfumes as well as clothing, which would have joined her with Monroe, in the French floral camp. Too bad the ladies never worked together. I can just imagine them, a diplomat (Hepburn) and a showgirl/spy (Monroe) joining together on a trip through Grasse where they meet Paul Henried and Charles Boyer. Hey, that sounds like a great movie! A shame it was never made. . . I know Monroe was quoted to wear No. 5, and I mostly mean to use her as an archetype–that I tend to choose the showier, maybe overtly feminine without being innocent, over the seemingly more introverted, intellectual styles I associate with the Hepburn archetype–if that makes any sense? I guess I could have easily said I was more a Joan than a Peggy (a la Mad Men) in my perfume stylings! Can it be directed by Billy Wilder? But did you know that Ida Lupino was actually a working director in that era? This is the second tempting review I’ve read of Branch and Vine — it sounds delightful. Not that I have any shortage of greens: have been wearing a lot of Chamade, Apercu, No. 19, Silences, Cristalle EDT, YSL Y, Private Collection, and vintage Ma Griffe parfum. Of those, I probably wear Y the most — it always seems to hit the spot, and it can be sprayed with abandon. Always glad to see mention of Apercu, I never hear about it. I don’t even always remember it myself, and I own a bottle. Vintage Ma Griffe is another one worth seeking out. I like a tinge of green in almost everything, and especially colognes, but don’t have too many fragrances of the “We demand a shrubbery!” type. For green through and through, I probably depend most on Aliage and Mito. A shrubbery perfume that smells nice? And that’s not too expensive? Yes, I wasn’t claiming it was my line I do love that ridiculous movie, though – but my favorite character is Dennis, the anarcho-syndicalist peasant. And several perfume ad videos do bring the words “farcical aquatic ceremony” to mind…. I know that Brian is considered the better movie, but I still am very, very fond of Holy Grail. It’s just one of the silliest movies ever made! “Your mother was a hamster and your father smelt of elderberries” is probably my favourite Python quote of all. Follow the shoe! Follow the shoe! Brian is a brilliant movie. Thanks! Remember Aliage? So green it shimmered. Planning a trip to Providence. This sounds like perfect scent. Oh dear, that isn’t what I meant at all, LOL — it isn’t anybody’s line anymore, right? We all own it. Was more meaning to point out that great minds think alike, or something. I read it as an allusion to BdJ, which made me smile, because I got it – no plagiarism at all! Monty Python rocks, can’t wait for my kids to get old enough to watch them all with them! Lovely Filth! Clearly a Monty Python perfume line is in order. I had been thinking that as well! We should come up with that line. I like green scents, not perhaps my favourite category, although I don’t really know what that might be, but worn in spring they are truly great. I like the usual suspects: Chanel 19, Cristalle EDT, Ninfeo Mio,Silences etc. Another great green and salty fragrance is Virgilio, one of the great early Diptyques. I don’t wear it that much but sometimes nothing else seems to fill that need. Virgilio is (was? can’t remember if they still make it) a great scent. Love the green in L’Ombre dans L’Eau as well. Wasn’t it brought back for a while? I got mine on evil-bay, for a song. I love the phrase: ” not quite so aggressively manicured”. It probably touches on why I’m not altogether a huge Chanel fan. Vent Vert — the ’90s version. I don’t care if it’s crap next to the vintage, it smells lovely to me. I thought the 90s version of VV was great too. Don’t know if it’s been redone again, although it seems likely. Balmy Days and Sundays, yes!! Beautiful green fragrance, with a lovely non-soapy freesia note! I haven’t tried anything from Providence Perfume Co. yet, but I’ve been wanting to. This one sounds really nice. I like green scents in the spring and summer. Niki de Saint Phalle, No.19 and Silences are my favorites. I think I’ve tried Vent Vert, and I remember liking it. I also like Chamade. Another interesting one is Papyrus de Ciane by Parfumerie Generale. It’s kind of a bitter green incense, maybe a bit masculine for me but well done. Very much worth trying, I think — and it isn’t a huge line so easy enough to do. Not that there aren’t 2 million scents worth trying at this point, so hey, we can’t do them all, right? Thanks Robin for the wonderful review- I really want to try this one. I love green scents. Annick goutal’s eau d’hadrien, neroli, Hermes un jardin en mediterranee are some of my favorites. I’m going to chime in as someone who is averse to most greens. In fact I just sold my Chamade as I realised that whenever I tried to wear it, it wasn’t a good experience for me. I find galbanum disturbing and that’s not going to change any time soon. And L’occitan’s Verte is one of my favourite perfumes! So probably you like some greens, but not aggressive galbanum. L’Ombre must have *some* galbanum*, right? And Private Collection probably does too! I just need the note to be very tempered. Yes, to me Private Collection seems quite, um, galbanumy. Perhaps its just as well I haven’t bought it. But when I try it, although it has a brisk starchy feel, it doesn’t actually cross to bitterness. It could be that its not galbanum per se, but most of the perfumes people are talking of here, I do not like! The ones I mention are exceptions, but maybe I haven’t worked out what makes them different. Atalier Cologne Trefle is a lovely green scent, which smells of lawns and clover. Long lasting too. I need to try that one again. I think I only tried on paper. Oh yeah I forgot about that one. I have a small decant of it. It is a nice one. I spray it on my clothes to make it last longer. I really like Fig Tree by Sonoma Scent Studio. It is one of Laurie’s longest lasting perfumes. (on me) And it has so many layers of fig yumminess!! I would not wear it, but I thought Opus VII by Amouage was a seriously interesting super green fragrance. Yes, Fig Tree was the scent that convinced me that I needed to explore Fig scents more. A lovely scent! Thirding the endorsement of Fig Tree as a great green scent–a lovely and yes, LONG lasting creamy green luscious fig! It is one of my favorite scents and quite possibly my signature, I love it that much. Speaking of green–and I know Angela reviewed it–but has anyone tried Piguet’s Futur? Curious about that one. I like Futur but, if you are looking for full on galbanum, then you might be disappointed. It’s a fresh, dewy, non-indolic jasmine with just a hint of greenery. I really like Eau D’Italie Jardin Du Poete. I should try that one again. So many greens make up a healthy olfactory diet! Chamade, Siliences, Ma Griffe, No. 19, Private Collection, Green Carnation (Pell Wall Perfumes), (old) Ombre dans L’Eau… I could go on. But my personal favourite is the galbanum and tomato leaf explosion that is Jean Claude Ellena’s early masterpiece for Sisley: Eau de Campagne. Oh, I used to adore Campagne before they redid it. Great scent. Does Bandit (and vintage Cabochard) count? Otherwise, I’ve always found greens to be not quite me. There are a few that I enjoy, but I need to be in the mood to wear them. Ninfeo Mio, L’ombre Dans L’eau and Bel Respiro have already been mentioned. To these I would also add Odalisque and Miller Harris Fleurs de Bois which, sadly, appears to be already discontinued. Fragrantica calls Flower Market by Lush green, so I guess it’s one of my favorite green perfumes — the healthy dose of carnation is what really does it for me. Flower Market was dedicated to Audrey Hepburn. Ah! So it’s not just me who thinks of green scents as a good fit for Ms. Hepburn! You and Mr. Constantine are quite perceptive! Another one I should try again. I have never tried Inoui — do they still make it? Patricia de Nicolai’s Le Temps d’une Fête, hands down. I think it smells like a better Ma Griffe, which I enjoyed very much a decade ago. So, what about some more affordable scents? I get compliments whenever l wear Cabotine. I am also using 90’s era Vent Vert. And Demeter has some lovely greens, such as Clover or Grass. I recently purchased a grass or garden Demeter oil from CVS Pharmacy. I also got their Earl Grey Tea scent. They both smelled good in the bottle, but I haven’t tried them on skin yet. The DSH mentioned above is pretty cheap! The original Gap Grass was great, less so now I think. Oh, and Body Time Green Fig Oil! Great stuff, dirt cheap. Not a big green fan but I love to wear Un Jardin en Mediterranee or Stecca in the summer. Stecca is yet another I have not tried, thanks! Not familiar with Providence Perfume Company – but I bet they don’t have a stockist in the UK! Perhaps one on my list for when I’m in the US next year. My all-time favourite green fragrances are Penhaligon’s Bluebell & AG’s Eau de Camille. Now I’m semi-retired I must read this site more often & join the discussions. No, they probably don’t, and they’re not all that easy to find here either — it’s a very small brand. and yes, do join in! I like Vent Vert and Diptique Eau de Lierre. I’ve also worn Ma Griffe. Lierre is great for anyone who wants a soft green. Agree, re: Gap Grass. Was once great, now it smells like grass clippings, lawn mower and sneakers. Plus laundry detergent & fresh air. I have been loving Jour d’hermes this summer. So much so I really want to try the body lotion. I do too — they make nice lotions. Some categories of green don’t get along with my skin – the green chypres become a murky, vegetal mess on me, but I’ve got a few that I love: Bel Respiro (and I’ve got scent-glue skin, so it’s all good), Silences, Heure Exquise and 1000 Flowers’ Fleur No. 1. I also enjoy the green aspect of L’Ombre dans l’Eau, Philosykos and Ninfeo Mio. I’m still on the hunt for a soft green, so DSH’s Celadon and a few others are on the TBS list. Oh, and now that I think about it, I just acquired a different kind of green frag, one of the last bottles of Vetiver pour Elle still found at a Guerlain boutique courtesy of Daisy, Queen of Enablers. Comme des Garcons Calamus, when it dries down, is also a very soft green — like plant sap. Thank you for the recommendation, it’s been added. I love Heure Exquise: I actually want it to replace my Chamade which is too harsh. Andrée Putman préparation parfumée. I’d really like to try some of the D.S.&Durga greens. DS & Durga is a great line.